Is fast food destined to morph into fast-casual? Taco Bell is opening a new “upmarket” concept called U.S. Taco Company in Huntington Beach this summer. KFC is testing out a Chick-fil-A style restaurant called Super Chix in Texas. Even Subway is considering a Subway Pizza Express outlet in Nebraska, with hopes of elbowing into the rapidly expanding customized pizza market. Now, Panda Express is getting in on the gourmet action too. The popular Chinese-American fast food chain, headquartered in Rosemead, opened their first-ever Panda Express Innovation Kitchen in Pasadena last week (not far from the original Panda Inn, which dates back to 1973). So how is the Innovation Kitchen different from your standard Panda Express? Well, in a lot of ways, actually. The decor and furniture is noticeably fancier and sleeker, with modern-looking lanterns hanging from the ceiling and bonzai relief artwork on the walls—imagine someone went on a massive shopping spree at Cost Plus World Market. There are big screen TVs, free wifi, and futuristic soda dispensers. You can quickly ascertain that Panda Express is making a huge investment in this place, not just by all its glitzy amenities, but also the sheer number of eager employees on staff. Off to one side of the restaurant is Panda Tea Bar, a completely new concept that offers hot or iced teas, fruit teas, milk teas, coffee, freezes and more. Is their boba? You know it. Plus pudding, chia seeds, and jelly to add to your drink. There’s a pastry case filled with packaged desserts like you find at many SGV bakery/tea shops. Next to the Tea Bar sits a small collection of leather chairs and coffee tables, just in case you wanted a place relax with your oolong tea while enjoying the wafting odor of chow mein and broccoli beef. But, of course, the biggest change is in the menu, which borrows generously from Asian build-your-own-bowl restaurants like ShopHouse and Asian Box. The layout is kind of confusing—alright, very confusing—but essentially it breaks down like this: You pick which “base” you want (rice, chow mein, salad, or scallion pancake) and then you choose one of several “mains”, which are listed in semi-explanatory categories like “Panda Classics,” “Chef’s Creations,” “Veggies,” “Stir-Fries” and “From the Grill.” Next you add as many complimentary toppings as you want which include different types of sticky-sweet sauce, chinese vinaigrette, sambal, green papaya slaw, cucumber pickles, crispy shallots, fried wontons, and crushed peanuts. Basically, it’s just one giant Asian melting pot of ingredients. If building your own bowl sounds like a lot of work compared to the usual Panda Express point-and-grunt, then you can order pre-designed salads, plates, wraps instead. The pricing, which is a tad higher than a standard Panda Express, doesn’t always seem to follow logic. At times you can build something for much cheaper than ordering the pre-designed equivalent. Not that it really matters. 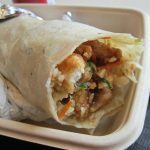 If you are like the 95% percent of people reading this article, you can ignore everything above and pay attention solely to this: PANDA EXPRESS NOW OFFERS AN ORANGE CHICKEN BURRITO. The scallion pancakes they use for the burritos (okay, technically they’re called wraps) are absolutely huge—like Chipotle huge. Like, I-doubt-anyone-in-China-ever-makes-them-this-size huge. And they’ll stuff them with absolutely whatever you want for the most part. The small gets you one entree in your wrap, while the large gets you two. That means you can form awesome combinations like Beijing Beef and Honey Walnut Shrimp, or whatever other wacky pairing your heart desires. Then comes the question, “would you like to add fried rice or chow mein to your burrito?” I think you know the answer to that, Panda Express lady. 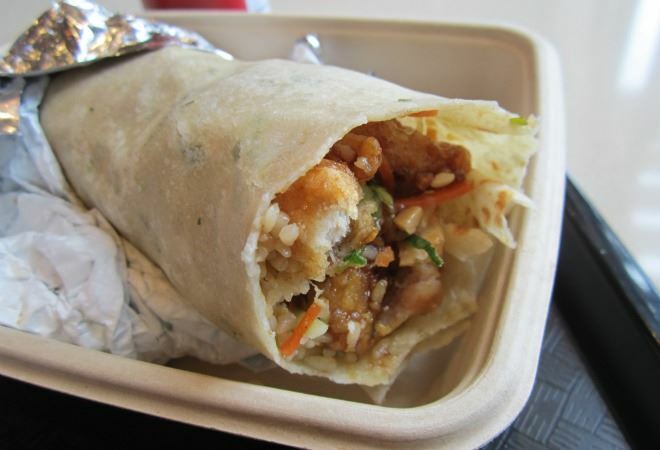 I thought my personal burrito combination was pretty clever: orange chicken, fried rice, mandarin sauce, papaya salad, crispy wontons and crushed peanuts. Maybe next time I’ll spring for the mushu vegetables too. The result was a sizable, two-fisted burrito speckled with bits of green onion. The tortilla (or pancake) was a bit dry but not terrible. And considering that the worker who wrapped my burrito previously only had to worrying about piling food into a styrofoam container with tongs, this baby was wrapped surprisingly tight. Although I can easily attest this was one of the better items I’ve eaten at Panda Express (and I say that as someone who makes a beeline to Panda at airport food courts), it mostly just tastes like American Chinese food wrapped up in a tortilla. Not that that’s a bad thing. It’s little wonder the staff mentioned that they often sell out of the scallion pancake wraps by early afternoon. The irony, hilariously enough, is that although the test kitchen’s overall emphasis is centered around healthier wok-tossed stir fries and fresh salads, it’s most popular item is a creation that’s actually unhealthier than the original. C’est la vie! Pasadena’s Panda Express Innovation Kitchen is the only of its kind in the country right now (what a city we live in!) but with the sheer energy the chain is putting into the test location don’t be surprised if this exploratory concept spreads faster than bird flu. Having seen the greatest minds of my generation destroyed by Cronuts and Doritos tacos, I can only dream of what havoc a burrito stuffed with orange chicken may wreck.